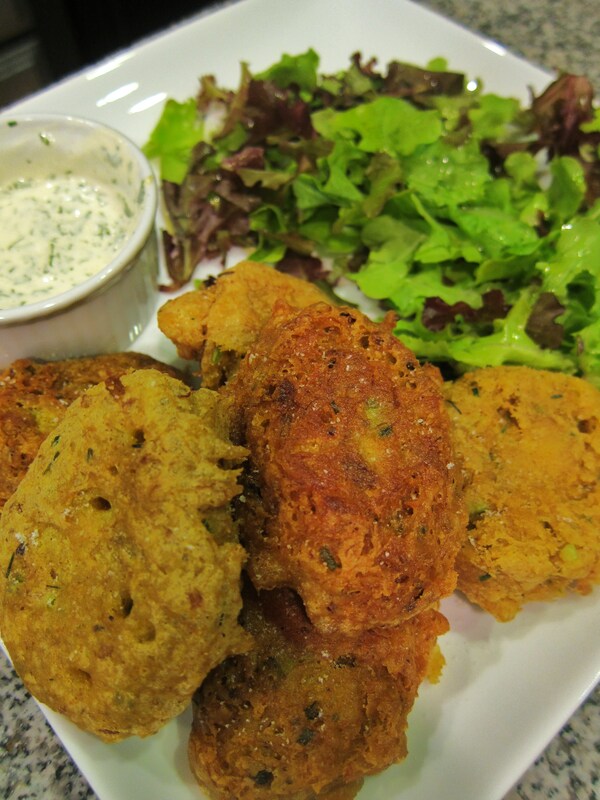 Curried Crab Beignet with Cilantro Aioli — Top Chef Masters Night | Eat.Drink.Life.Love. On our very first date, K and I shared a dessert of perfectly light, crisp and sugary-kissed beignets filled with hot steamy apples. We *still* talk about those little pillows of fried dough heaven. So when you call something a beignet, fritter, croquette, hush puppy — any fluffy, fried piece of wonderfulness, you’ve pretty much hooked us. So when Chef Sue Zemanick made curried crab beignets with cilantro aioli on Top Chef Masters, she pushed all our buttons and it was a no-brainer. I took a look at her original recipe (here) knew we could make a gluten-free version for me and a gluten-full version for K.
The gluten-free batter is very similar to the regular batter. 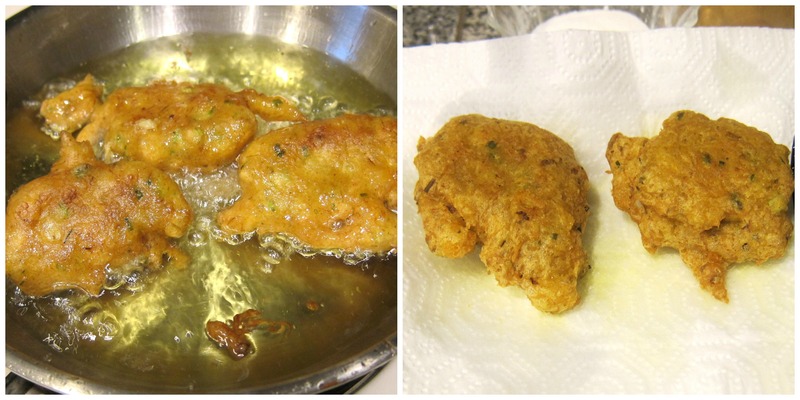 Jalapeno, celery, shallots, green onions, curry powder and chunks of crab stud every bit of the batter. And the subs are simple — just take out the all purpose flour and add chickpea flour (besan) and rice flour instead. GF batter on the left, regular batter on the right in the photos below. We also fried the beignets separately because we could make them twice as quickly using two pans of oil. But frying them separately also helps keep the gluten-full and the gluten-free apart and uncontaminated. Regular beignets frying on the left, gluten-free beignets draining on the right. And we fried and fried and fried and fried because I made WAY too much batter and it was filled with crab and we didn’t want to waste a bit of it. While K was frying, I was whipping up cheater aioli (using prepared mayo) and stealing bites of the fritters staying warm in the toaster oven. Because *some one* has to do quality control, right?! Because fritters are a pretty heavy meal, we piled up some farmers market greens with just a little lemon juice and olive oil to add some freshness to the plate. And load up those plates we did. The regular beignets were light and fluffy which allowed the sweet taste of crab to really come through. The gluten-free beignets looked weirdly like McDonald’s “chicken nuggets” (but thankfully tasted nothing like them). Putting that aside, they were more dense than the regular beignets and the warm, deep and complex curry flavor was at the forefront. And dipping those hot, crispy dough bits into the cool, creamy cilantro aioli was perfection. We even had plenty of leftovers that we froze in the hopes of baking to a nice crisp another day. So…yeah. Curried crab beignets. Do it. Whisk together batter ingredients in their respective bowls and let rest for 10 minutes. Heat the oil to about 375 degrees and drop in spoonfuls of batter. Fry until browned and crisp, about one to two minutes. Drain on a paper towel, salt to taste and keep warm in a 150-200 degree oven. Add spices and cilantro to mayo then add lime juice to taste. 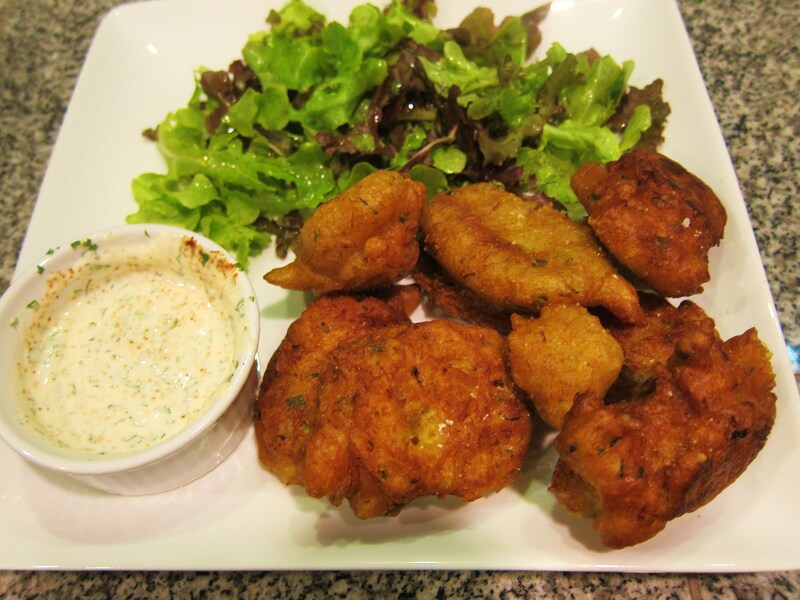 Salt and pepper to taste and add enough tepid water to make it the dipping sauce consistency of your dreams. Serve with a simply dressed side salad and savor the curry crab crunch!